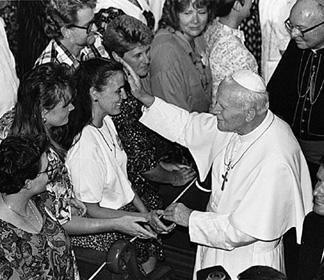 The well-lived life I’m speaking of is that of our former Holy Father, Pope John Paul II. 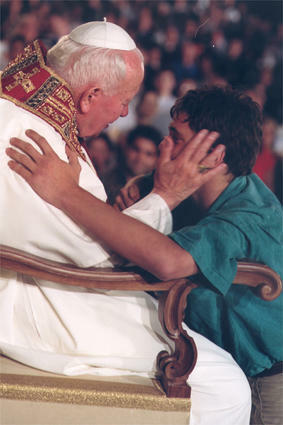 The lessons given by John Paul’s life are definitely for all of us, but today I will apply them specifically to the young people in the congregation. As we all know, our former Holy Father had a tremendous love for the young. That was clearly evident whenever a World Youth Day was celebrated. He inspired young people time and time again with his presence and with his words. And he definitely was inspired and energized by them—even when he was sick. Our Lord knew that within a few short hours his close friends would be plunged into a terrifying situation. He knew how fear—intense, overwhelming fear—would threaten to lead them into sin and destroy their faith. And so, like a Good Shepherd, he gave them a warning, and urged them not to be afraid. But he was much too humble to do that! So he simply let his actions verify his words—for over 26 years! Now his earthly life is complete, his ministry is finished—but his message lives on! “Be not afraid, therefore, to go to Confession.”—“Don’t let Satan keep you away! Don’t be afraid of being faithful to Mass and daily prayer! If you’re going to stay close to Jesus and discover his plan for your life, prayer and the sacraments are essential. That’s what did it for me—especially in my youth, when I suffered the loss of so many of my loved ones. My sister died in her infancy; my mother died when I was only 9; my brother, a young and promising doctor, died when I was 11 after he caught scarlet fever from one of his patients; and my father died in our apartment when I was only 20 years-old. I found him dead one day when I came home from work. Let pray today that all of us—young and old—will learn these lessons, and live these lessons, and then someday live forever with the incredible man, Pope John Paul II, who taught them to us. John Paul II with the young people he loved so much. 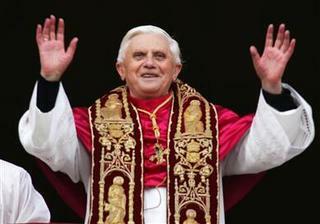 I interrupt this homily blog with an entry about our new Holy Father, Pope Benedict XVI. The election of Joseph Cardinal Ratzinger as the 264th Successor of St. Peter has orthodox Catholics rejoicing, and has driven the heterodox among us (not surprisingly) into a state of apoplexy! May the Lord deliver them from their distress by changing their hearts. 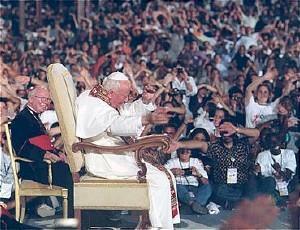 Now that Pope John Paul II has been laid to rest, speculation abounds concerning his successor. It needs to be made clear in this context that the pope is not a social innovator: he’s a guardian and a teacher! He is commissioned by Jesus Christ to guard the rich deposit of faith which has been faithfully handed down to him from the apostles themselves. Thank you for giving us a leader who will show the skeptics within the Church that there is no contradiction between teaching the truth and acting in love. 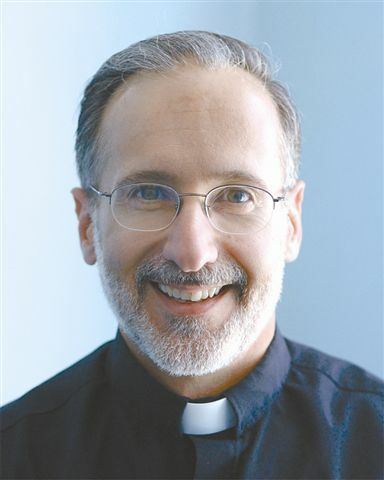 Thank you for raising up a man who will not be afraid to condemn the moral relativism and hedonism that are fast eroding Western culture; a man who will build bridges with all people of good will; a man who will avoid the “curse” of Galatians 1, and be a powerful instrument of blessing for both the Church and the world. Pope Benedict XVI, today we offer this prayer for you, as you begin your work among us as the Vicar of Christ! God’s Mercy: Unconditionally Offered, But Only Conditionally Received! What is unconditionally offered, but only conditionally received? 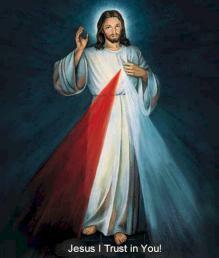 Today is Divine Mercy Sunday, designated as such by Pope John Paul II five years ago. This, incidentally, was a feast that was near and dear to the Holy Father’s heart. Hence it’s most fitting that we celebrated it this weekend—the weekend of his death. For the next 7 years the Lord gave Faustina many other private revelations concerning his mercy. He made it clear to her during this time that his mercy is unlimited and available to everyone, even to the greatest sinners. Or, to put it another way, he made it clear to her that his mercy is unconditionally offered. The Lord, you see, does not offer us his mercy because we’ve been good enough, or because we’ve accomplished enough or become smart enough. He doesn’t offer us mercy because we’ve received enough A’s on our report cards! Mercy is offered to us freely and unconditionally by God because his nature is love! As St. John tells us in the fourth chapter of his first letter, “God is love”. And this offer of mercy is rooted in what the Lord has done for us in sending his Son into the world to die on the cross! Consequently, it’s a free and undeserved gift. All of that applies to our relationship with the Lord: we are God’s creatures; we are subject to his authority and power. And our sins are infinitely offensive to him in his perfection. But, out of sheer mercy, he offers us his forgiveness and pardon anyway. 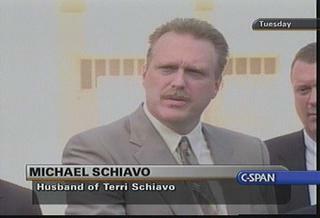 To people like Michael Schiavo—who murdered his own spouse. To people like Brian Nichols (the man I mentioned in my Easter homily last Sunday)—who killed three people two weeks ago in a Georgia courthouse, and one more as he was making his escape. To judges and politicians in this country who allow babies and sick people to be harmed and killed. To priests and bishops who are silent in the face of gross moral evil. To liars, cheaters, and thieves. To the hedonists, materialists, and blasphemers in the modern media. Mercy is offered to everyone, and it’s offered unconditionally—thanks be to God! Now in some homilies on this subject that I’ve heard over the years, this is where the preacher will stop—and that’s a mistake! He will speak about God’s marvelous, unconditional offer of mercy, and that’s where he will end his reflection. But that’s wrong—that’s a grave error—because it’s only half the story. Yes, it’s true, mercy is unconditionally offered—but it’s only conditionally received! One of the necessary conditions, of course, for the reception of mercy is genuine personal repentance! Not simply “spoken repentance,” but rather genuine repentance. Anyone can say they’re sorry. Anyone can mouth the words. The real question is: Are they sincere? I think we’ve all known people who have said they were sorry for something, and then later admitted that when they said the words they really didn’t mean them! Quite frankly, I remember doing this as a child. . . . But I wasn’t sorry! At least on some occasions I wasn’t! I just didn’t want to get sent to my room for the rest of the day! Sincere repentance is different, isn’t it? Sincere repentance includes a desire not to commit the sin again (whatever it is), and the intention of bringing it to confession at the next available opportunity (if it’s a mortal sin). But that’s not the only condition that must be fulfilled to receive mercy. There’s one more that needs to be mentioned: a willingness to show mercy and forgiveness to others. Now that really shouldn’t be news to any of us, should it?—because every time we say the Lord’s Prayer we tell God not to forgive us if we don’t forgive others. But what if we don’t pardon—or at least make the constant effort to pardon—those who have sinned against us? Then, in effect, we are telling the Lord when we pray the Our Father to keep us in a state of sin! We need to take those words seriously. Forgiveness, obviously, is hard for all of us. In fact, even thinking merciful thoughts about certain people can be hard for us at times. I’ll be honest with you, I find it very, very difficult to think any merciful thoughts about Michael Schiavo, because of what he did to his innocent, helpless, disabled wife. But I have to make the conscious effort to do it anyway! I need to pray for his conversion, and especially for his salvation (which is definitely in jeopardy at this point for his sins of murder and adultery). We all have Michael Schiavos in our lives. How we respond to them is crucial, because to a great extent it will determine which group we are in at the end of time. You see, on Judgment Day, when we all stand before the throne of Almighty God, there will really be only two groups of people present: those to whom mercy was only offered, and those to whom mercy was offered and by whom it was received! All human beings—even those who go to hell—will have experienced God’s beautiful offer of mercy; but the only ones who will actually receive it in the end and reap its eternal fruits will be those who have sincerely repented of their sins, and who have been willing to show mercy to others—even the Michael Schiavos of their lives. May all of us, by the grace of God, end up in that second group—and experience the eternal blessings of God’s wonderful mercy.